Open enrollment for the ACA exchanges starts on October 1. As more Americans get health insurance, what will happen to ED visits? What happened when Massachusetts enacted similar reform? The argument makes some intuitive sense. As some people gain health insurance coverage, they will have one less barrier to going to the ED, driving up visits. And similar to the Affordable Care Act, Massachusetts' reform focused on covering the uninsured but did little to increase primary care, so of course they will come to us. Of course there are differences between Massachusetts and the country as a whole. The health care environment in Massachusetts is different than in the US, both before and after reform. For starters, state health reform decreased Massachusetts’s uninsured rate from only 10.9% in 2006 to 6.3% by 2009, compared to the >17% national uninsurance.13 And the ACA is not identical to Massachusetts’ reform. The ACA is by no means perfect. Neither was health reform in Massachusetts. But despite the pessimistic views of some, health reform in Massachusetts did not flood EDs with patients. It’s no secret that EDs across the country are busy. But the increase in ED visits in Massachusetts doesn’t mean that ObamaCare will flood our EDs. 2. Goodman J. What Will Happen To Emergency Room Traffic? Health Affairs Blog. July 12th, 2010. 3. Suderman P. Like Long Medical Wait Times, Crowded Emergency Rooms? You’ll Love ObamaCare. Reason Hit & Run Blog. May. 4, 2011. 6. Chen C, Scheffler G, Chandra A. Massachusetts' health care reform and emergency department utilization. The New England Journal of Medicine. Sep 22 2011;365(12):e25. 7. 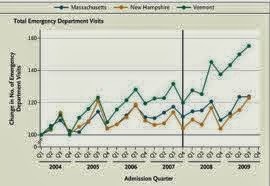 Massachusetts Emergency Department Visit Volume, FY2005-FY2009. Massachusetts Division of Health Care Finance and Policy. 8. Pitts SR, Niska RW, Xu J, Burt CW. National Hospital Ambulatory Medical Care Survey: 2006 emergency department summary. National Health Statistics Reports. Aug 6 2008(7):1-38. 10. Long SK, Stockley K, Dahlen H. Massachusetts health reforms: uninsurance remains low, self-reported health status improves as state prepares to tackle costs. Health Affairs. Feb 2012;31(2):444-451. 11. Miller S. The Effect of Insurance on Emergency Room Visits: An Analysis of the 2006 Massachusetts Health Reform. 2012; http://papers.ssrn.com/sol3/papers.cfm?abstract_id=1711502. 12. Smulowitz PB, Lipton R, Wharam JF, et al. Emergency department utilization after the implementation of Massachusetts health reform. Annals of Emergency Medicine. Sep 2011;58(3):225-234 e221. Surprisingly, there was a twitter conversation about PE workup. Here is my PE algorithm. Most of you will recognize most of it. Additionally, an incredibly similar path was articulated very well by Jeff Tabas on the June 2013 EM:RAP. If you do it right, you should never be angry at a positve d-dimer.